This beautiful 3 year log girl is looking for her forever home. For now, the closet opening makes a make shift crate. I’d like to introduce the newest member of the family, Smokin Motor, also known as Rio. 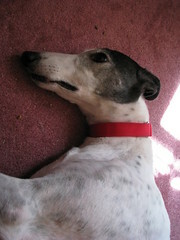 He is a sweet-tempered, lovable, seven-year-old, retired racing greyhound. Rio came up for adoption a second time, after four years, when his first family was no longer able to take care of him, due to a change in schedule. Here he is doing what greyhounds do best, flaking out. Everything about Rio’s temperament, as we’ve seen so far, seems like it will fit in perfectly with our family. We are very excited about our new family member.